The benefits of installing comprehensive fume and dust extraction systems are far reaching. They deliver economic benefits, such as lower scrap rates, discounts on health insurance, and lower heating and cooling costs. They offer the peace of mind that comes with knowing that OSHA won’t be imposing huge fines for dirty working conditions, which also results in less money spent on employee recruitment and retention. Portable solutions are key when creating a safe and clean work environment facility-wide. The ecological benefits are also compelling. In addition to emitting fewer pollutants into the outside air, touting a business as earth friendly has the power to attract new customers – especially those that are environmentally conscious. Studies have shown that “going green” gives companies a competitive advantage with consumers. Despite the long list of benefits, there are still fabricators and manufacturers that have not invested in comprehensive fume and dust extraction – the type of system that can make a deep impact on employee health, the environment and, overall, the bottom line. Therefore, it makes sense to offer a friendly reminder that not only is the ROI on such systems faster than one might think, but it also just makes smart business sense. Rattling off the list of the benefits that comes from proper fume and dust extraction is easy, but truly understanding how clean air can affect scrap rates or cooling costs requires a deeper dive. To understand how clean air can create better business conditions, Bob Newcomb, product manager and 30-year veteran at Nederman Holding AB, explains. “Everybody talks about the regulatory issues as a big driver for investing in fume and dust extraction equipment and solutions, and although it’s important to be compliant, there are numerous other economic advantages as to why it’s essential to install these types of systems,” Newcomb says. “Think of a company trying to attract new customers. When they bring in potential customers, they want their facility to look good; they want to show off a clean, safe work environment. Dirty air and film on every surface certainly doesn’t fit that description. It also creates additional expense to clean the products manufactured prior to painting, packaging and shipping. 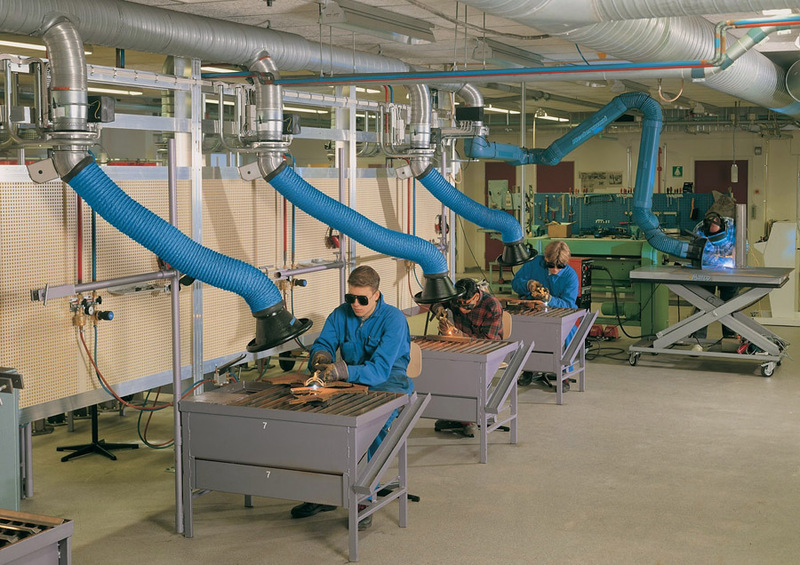 Multiple Nederman extractor arms can be positioned over multiple workstations to ensure employees’ breathing areas are clean of noxious fumes. Every saw, press brake and laser cutting head is expected to be incredibly precise, and is negatively affected by the accumulation of dust and particulates. In addition to impacting the quality of a cut or bend, with proper dust collection, throughput can increase, as well. Beyond the actual processing of parts, general overhead expenses, such as heating and cooling costs, are also affected by the lack of proper fume and dust extraction systems. In some facilities, a typical method of ventilation is to simply open windows or overhead doors and use a giant fan to blow dirty air outside. Perhaps the biggest costs associated with poor air quality are those associated with employee recruitment, retention and health. Like courting customers, employers need to entice skilled job candidates with an attractive working environment, which demands clean air. Unsurprisingly, the cleaner the work environment, the higher the chance a new employee stays, resulting in less expense wasted in training a revolving door of employees. A clean work environment also results in fewer chances for employees to get sick, call in and require either a replacement or a total work stoppage because there isn’t anyone to take their place at their station. The costs for either can be damaging. Once the value of a clean shop is understood, the next step is investing in and installing fume and dust extraction equipment. More often than not, the best approach to get the job done is a combination of solutions, including large overhead ventilation systems as well as products that capture fumes and dust right at the source. 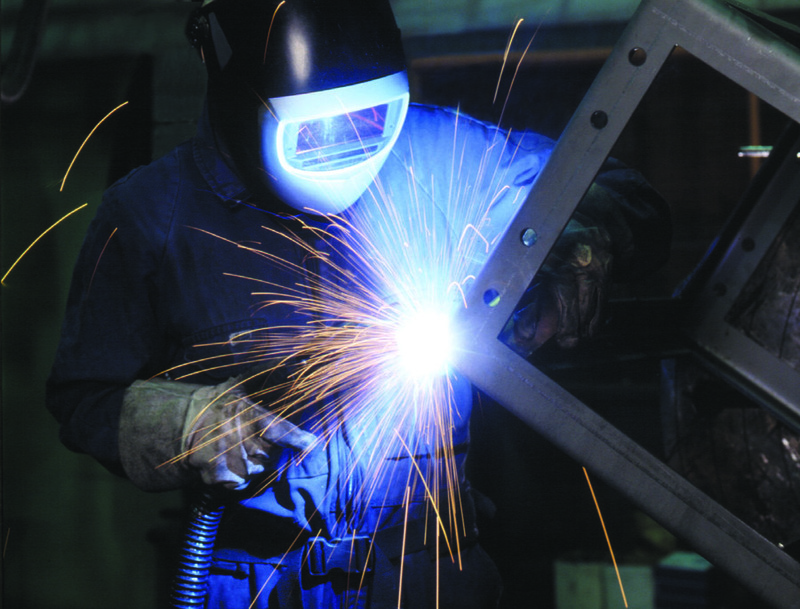 Fortunate for fabricators, there are several equipment providers to choose from when it comes to creating a clean and safe work environment. 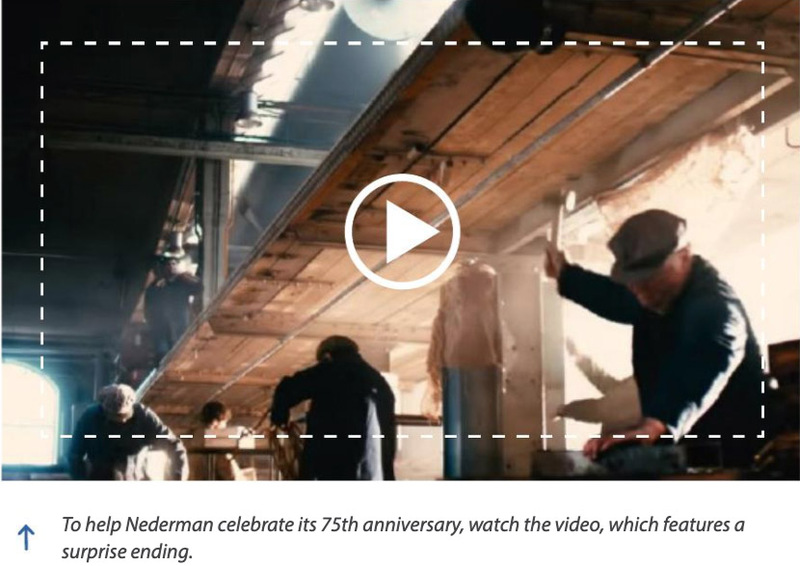 One of those companies, Nederman, is celebrating its 75th anniversary this year and is using the milestone to punctuate its long-standing commitment to protecting people and the planet from harmful fumes and dust. Nederman was founded in Helsingborg, Sweden, in 1944 by Phil Nederman, a sheet metal worker at a local shipyard that saw a need to get compressed air and water hoses off of the floor. With employee safety in mind, he developed a hose reel that could remove the tripping hazards presented by the various hoses used in shipyards and other construction and manufacturing sites. While producing his hose reels, he noticed the fumes that were being emitted by the welding portion of the manufacturing process. So again, with employee safety in mind, he set out to do something about it. From there, the extractor arm was born – a better solution to the fume extraction methods of the time, which, primarily, were overhead hoods or fans. The extractor arm, an at-the-source capture system, was a stepping-stone solution to Nederman’s eventual full-range of fume and dust extraction products and solutions. Nederman offers a range of extractor arms with different diameters and lengths. From the company’s compact telescopic arm that works well in welding schools to heavy-duty arms for production welding that can extend up to 30 ft., there’s something for everyone. And, when positioned properly, they capture 95 to 100 percent of the fumes and can hold any position they are placed in to assure that high rate of capture. The mobility of the extractor arm is incredibly helpful considering the changing nature of a welder’s job. In addition to the extractor arm, however, bench-top products, such as a slotted hood mounted to the side of a workbench referred to as backdraft and downdraft (when slots are on the table) tables are effective. This type of extraction can be used when the extractor arm is not effective for the application. Unlike an overhead hood, a slotted hood pulls fumes away from a welder instead of from above, past a welder’s face. Recognizing the need for a multi-solution approach, Nederman’s product catalog is comprehensive, including portable and compact fume and dust extraction units, filters, filtration systems, hoses and cable reels, ductwork and piping, and a full range of extraction units, such as the company’s extractor arm, slotted hood and backdraft tables. Ancillary products, such as vacuums and floor wands, are also available to collect dust and other particulates that settle on the floor and on work surfaces throughout a shop. Although vacuums and floor wands may seem like a small piece of the overall fume and dust extraction puzzle, they are essential for truly creating a facility that is safe and attractive for employees and potential customers alike. 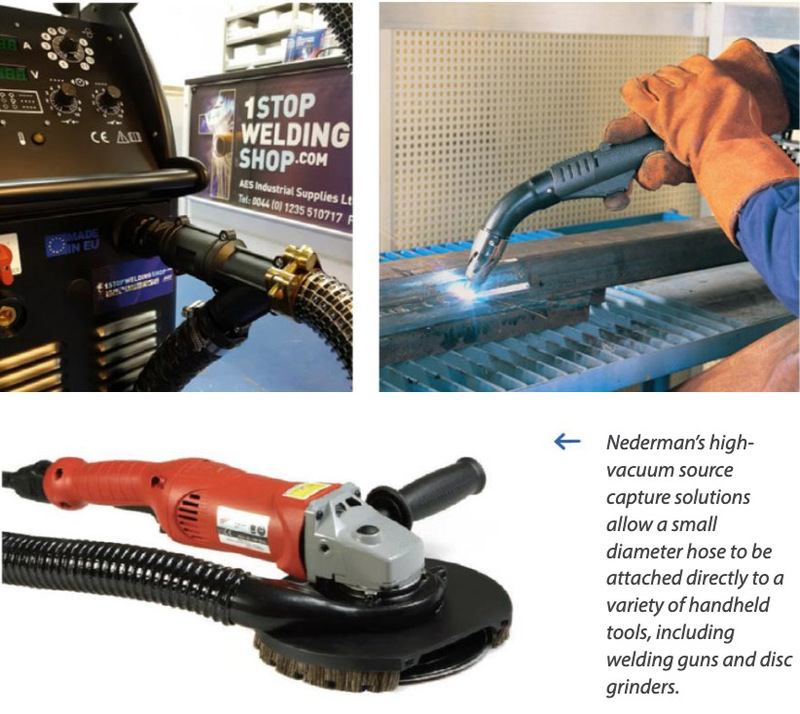 For fabricators leveraging a central vac system, like the type connected to Nederman’s extractor arms, attachments, such as vacuums or floor wands, can be used. They are often the preferred method for cleaning up any remaining dust that’s accumulated on a work bench or on the shop floor. “I’ve seen people take a compressed air hose to blow off the dust that’s collected on their work bench or around it on the floor,” Hotchkiss says. “But they haven’t really cleaned anything. They basically just produced a cloud of contaminants that someone is going to end up breathing in. When proper fume extraction is in place, welders – and all employees – benefit from cleaner air and healthier overall facilities. Although it may be hard to believe, there was a time – not so long ago – when clouds of dust and fumes were the sign of productivity. Fortunately, those days have passed, and those conditions are no longer acceptable. With the installation of fume and dust extraction solutions as well as the adoption of better, cleaner work habits, the dirty stigma attached to the manufacturing industry can be sucked away.